1 pack of Puff Pastry. 2-3 tablespooons of caster sugar. Preheat oven to 200ºC. Roll out the pastry in to a thin rectangle (approx. 5mm thick) big enough to cut out 9 round discs approx. 4″ in diameter. Place the discs on a baking sheet lightly dusted with flour and then place a roasting tray on top of the discs to keep them flat and prevent them from puffing up. You may have to do this in two batches depending on the size of the discs and your baking sheet/roasting tray. Place in oven and cook for approx. 15/20 mins until golden. Wash and trim the strawberries. Take two-thirds of the strawberries and chop into a small dice. Use the remaining third of the strawberries to make a coulis by placing them in a pan together with 2 or 3 tablespoons of caster sugar and heat on a medium heat until soft. Remove from the pan, blend until smooth and then sieve to remove any seeds and set aside to cool. When cool add a couple of tablespoons to the diced strawberries and mix well. Remove the discs from the oven and when cool enough to handle cut each disc in half carefully using a sharp knife to make 2 discs – giving you a total of 18 discs. Whisk the cream with the vanilla extract until quite thick. 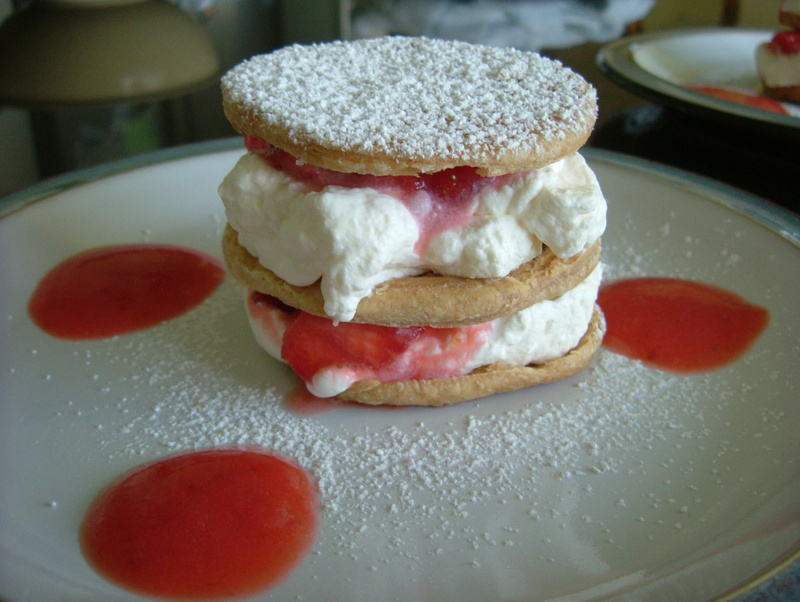 Using 3 discs of pastry per serving, place half a teaspoon of coulis in the middle of a plate to keep the first disc from sliding, place one disc on the coulis and then add a heaped tablespoon of cream, and then top with a tablespoon of the diced strawberries. Place the 2nd disc on top followed by another layer of cream and strawberries. Place the 3rd disc on top and lightly dust with icing sugar. Serve with a teaspoon or two of coulis. So so simple but people always think they are impressive. Its all an illusion….. Impressive but secretly simple are the best kinds of recipes!